The 2015 PokerStars and Monte-Carlo® Casino EPT Grand €25,000 High Roller, a single-reentry tournament that attracted 215 entries — 162 unique (159 on Day 1 + three on Day 2) and 53 reentries (42 on Day 1 + 11 on Day 2) – and created a prize pool of €5,267,500, came to an end Friday night as 21-year-old Charlie Carrel topped a tough final table to capture the €1.114 million first-place prize. The event marked Carrel's first €25K, and while it's his biggest success, it's not his only one. Back in November, Carrel made himself known by topping a field of 212 entries to win the 2014 Grosvenor UK Poker Tour Grand Final for £108,625, and less than two months ago he finished fifth in the EPT Malta €10,000 High Roller for €183,800. "I've been living out of a suitcase for five months now," Carrel admitted after the win. As to what's next, "I think it's going to be what town to go to for a celebration with my friends." Carrel, who plans to attend the 2015 World Series of Poker in order to play the $111,111 One Drop event, was upfront that the win wasn't just his own as he'd sold pieces. "I'm extremely excited to give a chunk of this away to my friends," he said with a big smile on his face. A dozen players returned for the third and final day of action, but after just one hand it was down to 11. That's because Andrey Andreev, an amateur businessman from Russia, got lucky to crack the aces of Yingui Li. It was a big hand and set the tone for the day. From there, Dominik Nitsche, Martin Jacobson and Pablo Melogno all hit the rail to set up the official final table. A few more hours would pass before the next elimination, but it happened when a short-stacked Dan Smith, who was so ill the night before he went to the hospital to get some fluids and antibiotics, shoved all in from middle position for 505,000 and Carrel looked him up from the button. It was a flip, and while the flop didn't hit Carrel directly, it gave him a lot of outs to win the pot. The turn was one of them, and suddenly Smith needed one of the two remaining deuces to stay alive. The dealer burned one last time and put out the . Smith missed and became the first player eliminated from the final table after 53 hands of play. 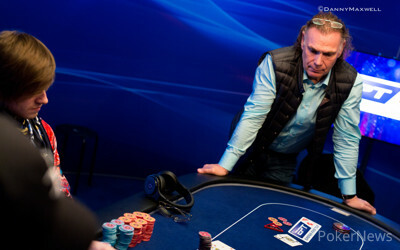 After Jeremy Ausmus lost a race to Steve O'Dwyer to fall on Hand #90, Italy's Dario Sammartino, who finished fourth in the €100,000 Super High Roller for €709,500 and 17th in the Main Event for €51,350, followed him out the door five hands later after losing a flip of his own. The €257,400 Sammartino earned for sixth place pushed him past €1,000,000 in cashes at the EPT11 Grand Final. Not too shabby. From there, Max Altergott took his leave in fifth place, and then Andreev, the start-of-the-day chip leader, busted in fourth. 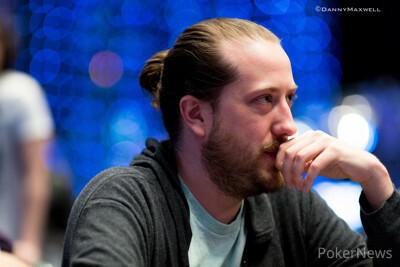 O'Dwyer, who finished as the Day 1 chip leader but came into the final 12 as the short stack, had an up-and-down day. One second he'd be flush with chips, while the next he'd find himself in the danger zone. Still, he managed to ladder up all the way to third place, which is when he got it in with kings only to get cracked by Carrel's sevens. Carrel began heads-up play with a significant lead against France's Imad Derwiche, and it'd take him just 30 hands to seal the deal. On Hand #160 of the final table, which took place in Level 27 (40,000/80,000/10,000), Derwiche shoved from the button, and Carrel called. Carrel called out the situation to his friends on the rail. "He's suited though, so it's like a flip," he joked. There wasn't much sweat as the board rolled out , and Carrel took the pot and the tournament. 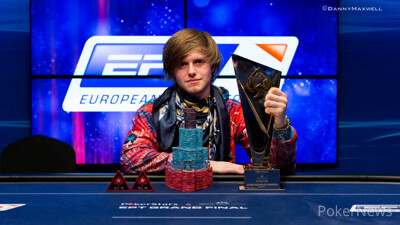 Congratulations to Charlie Carrel, the EPT11 Grand Final €25,000 High Roller champ! Here's Carrel's reaction after taking down the biggest poker tournament of his life. Hand #153: Charlie Carrel opened for 160,000 on the button, and Imad Derwiche called. They checked down the board until Derwiche bet 300,000 on the river. Carrel thought briefly and called. "You win," Derwiche said, showing . Carrel revealed . Hand #154: Carrel got a walk. Hand #155: Carrel raised to 200,000 after the level moved up, and he took the pot. Hand #156: Derwiche shoved from the button, and Carrel folded. Hand #157: Carrel raised to 200,000, and Derwiche called. They checked down a runout, and Derwiche bet 300,000. Carrel raised to 600,000, and Derwiche called. Carrel showed for a ten-high straight. Derwiche showed for the low straight. Hand #158: Derwiche shoved, Carrel folded. Hand #159: Carrel called, Derwiche checked, and they saw a flop. Carrel bet 100,000, and Derwiche check-folded. Hand #160: Derwiche shoved from the button, and Carrel called. 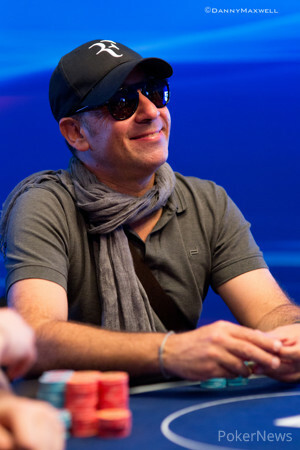 Hand #142: Imad Derwiche gave Charlie Carrel a walk in the big blind. Carrel showed the . Hand #143: Carrel gave Derwiche a walk. Hand #144: On the button, Derwiche raised to 400,000. Carrel commented how the raise was big, then folded. Hand #145: Carrel raised to 160,000 on the button, and Derwiche called to see the flop come down . Derwiche checked, Carrel bet 200,000, and Derwiche folded. Hand #146: Derwiche gave Carrel a walk, folding the from the button. Hand #147: Carrel made it 160,000 to go on the button, and Derwiche folded. Hand #148: Derwiche raised to 240,000, and Carrel folded from the big blind. Hand #149: Carrel gave Derwiche a walk in the big blind. Hand #150: Derwiche raised to 240,000 on the button and won the pot. Hand #151: Carrel made it 160,000 to go from the button, Derwiche called, and the dealer spread the flop. After Derwiche checked, Carrel bet 200,000. Derwiche check-raised to 460,000, and Carrel called to see the come on the turn. Both players checked, and the river was the . Derwiche bet 500,000, and Carrell called. Derwiche showed that his check-raise was a bluff, but he did pair on the river with the . Carrel had top pair on the flop, though, and his won the hand. Hand #152: Derwiche raised to 200,000, and Carrel called from the big blind to see the flop. Carrel checked, Derwiche moved all in, and Carrel folded. Hand #136: Charlie Carrel got a walk. Hand #137: Carrel raised to 160,000, and Imad Derwiche called. Derwiche check-called 200,000 on the flop, and an turned. Derwiche check-called 500,000 this time. He checked the , river, and Carrel bet 800,000. "Bluffing me?" Derwiche asked. He repeated the question twice. "Your heart boom boom boom boom boom. Why so much?" He decided to call, and Carrel showed , a flopped flush. Derwiche revealed the . Hand #138: Carrel got a walk. Hand #139: Carrel raised to 160,000, and Derwiche called. Derwiche checked and called a bet on the flop, and he checked the turn. Carrel checked back then folded to 300,000 on the river. Hand #140: Derwiche made it 280,000, and Carrel folded. Hand #141: Carrel raised to 160,000. Derwiche reraised to 500,000, and Carrel folded. Hand #131: Charlie Carrel had the button on the first hand of heads-up play, and he gave Imad Derwiche a walk in the big blind. Hand #132: Derwiche raised to 240,000 on the button, and Carrel called from the big blind to see the flop come down . Carrel checked, Derwiche bet 400,000, and Carrel folded. Hand #133: Carrel made it 200,000 to go on the button, and Derwiche called. The flop was checked by both players to see the land on the turn. Derwiche bet 300,000, Carrel called, and the river was the . Derwiche bet 500,000, and Carrel tank-folded. Derwiche showed him the for a bluff. Hand #134: Derwiche made it 200,000 to go on the button, Carrel called from the big blind, and the flop came down . Carrel check-called a bet of 300,000 on the flop, and then both players checked the turn card and river card. Derwiche opened the after Carrel announced he had a five, and his pair of jacks gave him the pot. Hand #135: Carrel made it 200,000 on the button, and Derwiche called. The dealer spread the flop, and Derwiche check-called a bet of 235,000 to see the land on fourth street. Both players checked, and the river was the . Derwiche tossed out 600,000, and Carrel folded instantly. Hand #128: Steve O'Dwyer got a walk. Hand #129: O'Dwyer shipped for 1.24 million in the small blind, and Charlie Carrel called. O'Dwyer was behind but took the lead on the flop. The turn and river kept him best. Hand #130: O'Dwyer raised to 180,000 on the button, and Carrel jammed from the big blind for 2.69 million effective. O'Dwyer called with , crushing Carrel's . O'Dwyer looked poised to retake command of the tournament as flopped, but a brutal hit the turn for O'Dwyer, leaving him in need of one of the last two kings. instead, the fell, leaving the tournament heads up. Hand #123: Charlie Carrel raised to 160,000 on the button, and Imad Derwiche defended his big blind. Both checked the flop, and the turn made the board . Derwiche bet 200,000, and Carrel made it 400,000. Derwiche called, and both checked the . Derwiche showed and won the pot. Hand #124: Steve O'Dwyer raised to 170,000 on the button and folded to Derwiche's shove. Derwiche showed . Hand #125: Derwiche raised to 300,000 on the button, and O'Dwyer called from the big blind. Dwyer checked, Derwiche shoved, and Dwyer quickly folded. Hand #126: O'Dwyer shoved in the small blind, and Derwiche tanked awhile before folding . Hand #127: Derwiche limped from the small blind, and Carrel made it 280,000. Derwiche called and then check-called 280,000 on the . Derwiche then fired out 425,000 on the , and he checked the . Carrel bet 400,000, and Derwiche snap-called. Carrel showed but Derwiche caught him with . Hand #120: Charlie Carrel limped in from under the gun for 80,000, and then Andrey Andreev raised all in on the button for 250,000. Steve O'Dwyer called from the small blind, and Imad Derwiche called from the big blind before Carrel reraised all in. O'Dwyer and Derwiche folded, with Derwiche laying down the and acting like he really wanted to play it. O'Dwyer said he also had a king, and that would make for all the kings out if true because Carrel had the , and Andreev had the . 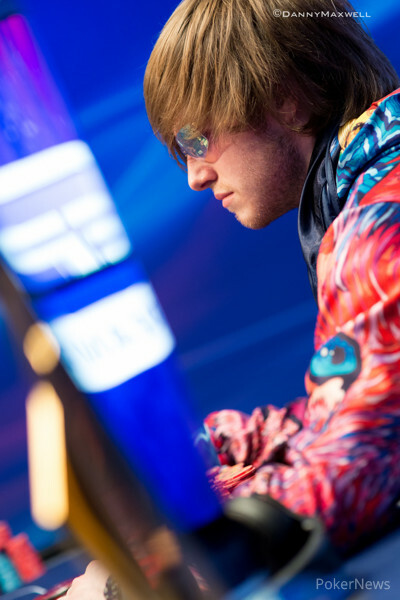 The flop, turn, and river ran out , and Andreev was eliminated in fourth place for €428,700. Hand #121: O'Dwyer had the button and moved all in. Everyone folded. Hand #122: Imad Derwiche moved all in from the button to win the pot. Hand #116: Steve O'Dwyer shoved all in from the small blind, and Imad Derwiche folded. O'Dwyer showed . Hand #117: O'Dwyer limped the button, Derwiche completed, and Charlie Carrel raised to 300,000. Both players called, but Carrel's 240,000 bet took it down on the flop. Hand #118: Imad Derwiche jammed from the button for 715,000, and Andrey Andreev snap-called in the big blind. Derwiche wasn't pleased when he got snapped, but he was in a race, and he won as the board came , giving him queens up.